Hi there. Are you ready for summer? We still have 3 weeks of school left here. Which means I have 3 more weeks to come up with a game plan to keep my kids from fighting all summer long. Luckily, I’ve discovered some great resources that I think are going to be super helpful. If you’re looking for ways to not only survive summer, but to make it an irresistibly amazing one, check out these 9 summer printables that will help you create a summer your family won’t soon forget! If the thought of all your kids all together ALL SUMMER LONG makes you a little nervous, I get it. My boys have kicked their sibling rivalry into high gear lately and the idea of being with all of them all of the time for 8 weeks makes my eye twitch a little. While I’m a firm believer that kids shouldn’t be entertained all of the time, I also know from experience that bored kids are bickering kids. In order to keep the peace – and my sanity – I plan to have a few activities that I can turn to when things get a little too crazy. These summer printables are perfect because they mean less work for me. Sure, I could design similar ones myself, but time is worth something to me. When all I have to do is print them out, some minor prep work and they are ready and waiting for when I need them most, I am willing to spend a few dollars. These are all printables offered by The Dating Divas so you know the quality is awesome, the designs are gorgeous and I love that I can save them on my computer and use them again and again. Make this summer a summer of memories! All you have to do is download your favorite summer printables, save them to your computer, print them out and do some minor prep work and you’ll have a fun project waiting for you and your family to enjoy together. Click through on the images below to see complete details on what’s included in each printable pack. Ready to check these out? If you don’t know where to start, this is for you. 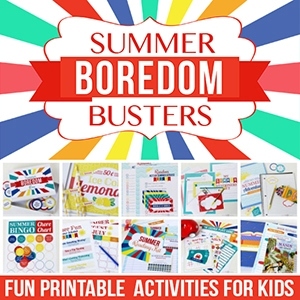 This Summer Boredom Busters Pack has activity cards to keep that boredom monster at bay! Have a lemonade stand, do some random acts of kindness, or write letters to family and friends. There’s an adventure journal to keep track of all the awesome things you do this summer. 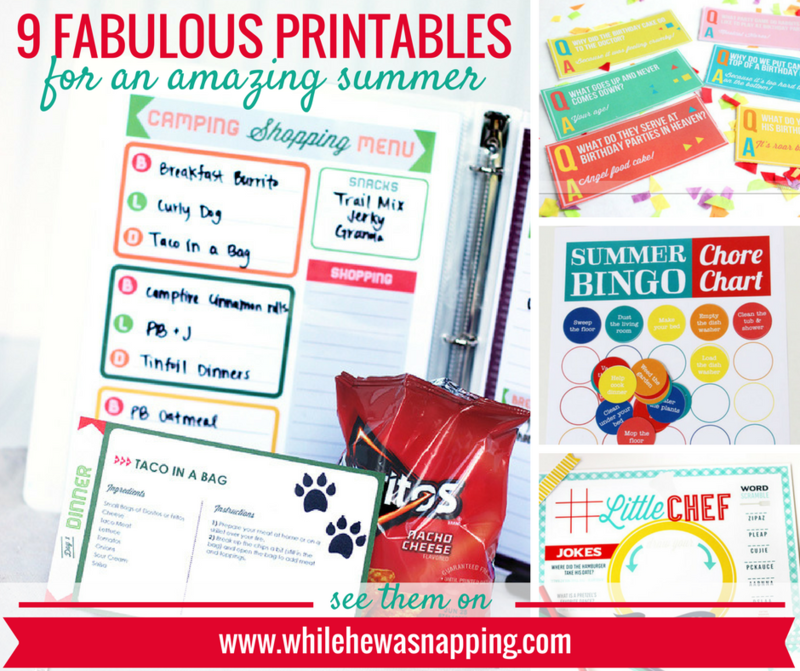 Reading trackers, summer schedules, calendars, chore chart bingo and road trip games are some of the other great activities included in this pack. Beat the “I’m boooorreed” with these great summer printables. This was included in the Summer Printable Bundle and I am super excited to use it when we hit the road this summer. The Road Trip Adventure pack includes something for everyone in the car – yep, even the grown-ups! A new activity every hour will get you there before you know it. 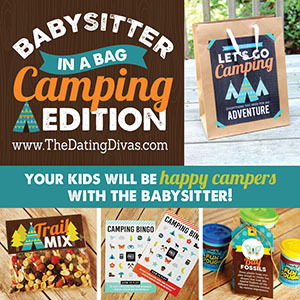 There’s games and printables for the kids and there are printables for your next getaway with your sweetie too! If you’re headed out camping, this fun kit will help keep everyone happy… and out of the fire pit! There’s some fun activities to help your family acclimate to life in the great outdoors. You’ll get a packing list and a to-do list to make sure you take everything you’ll need for an awesome adventure, a camping menu, camping games, scavenger hunt and a fun s’mores kit to make the best part of camping just a little bit better. If staying home is more your speed this summer, make your next staycation one for the books with this Family Staycation Adventure pack. 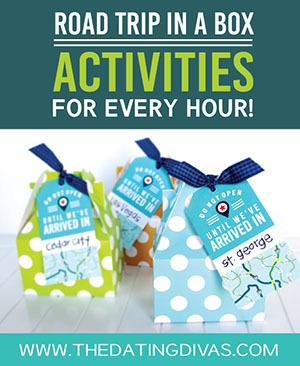 Officially invite your family to your special family time with some fun invitations. There’s a fun bucket list and a customizable itinerary you can fill out together so you’ll be sure to make the most out of your vacation time. Activity ideas to help you make sure it feels like vacation, instead of being stuck at home will come in handy if you need some help coming up with ideas to keep everyone happy and entertained. Plus, there’s a little something special for you and your sweetie after the kids are in bed. Ooh-la-la! 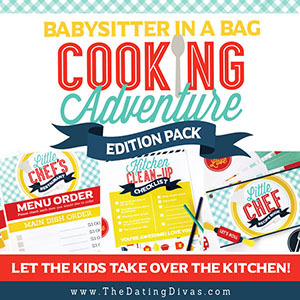 If you just need something to do for an evening, the Babysitter in a Bag ideas are perfect. While designed for you to leave with the kids and sitter while you go out, there’s no reason you can’t stay in and do it with the kids! I think I’d probably want to watch my kids enjoy these printables, they look like a ton of fun! The Cooking Adventure includes a kid’s recipe booklet, a DIY chef hat, printable games, activity place mat, a clean up list and more! Your kids will get to explore the kitchen while they learn and play! I am going to save this one for an afternoon and do it with my kids! If actually going camping isn’t in your plans, bring the camping to you! Everyone will enjoy the best parts of camping and they will still sleep like little babies in their own beds with this Camping Adventure pack. Camping without my kids up at the crack of dawn? Yes, please! 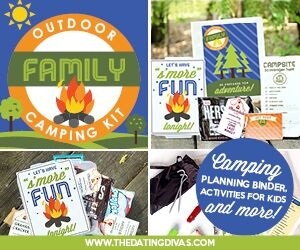 This pack includes scavenger hunt, games and other great camping ideas, plus a recipe for easy indoor s’mores. It’s the best of both the indoor and the outdoor worlds! Do you have a summer birthday in your family? 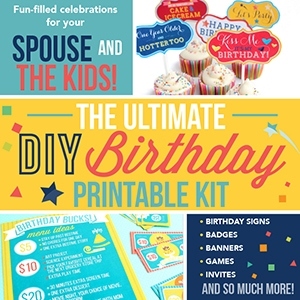 Celebrate in style with this fun Birthday Celebration pack. There are printables for both the kids and the grown-ups, so you’ll have what you need no matter what. You’ll get decor, activity ideas to fill the day with amazing memories, gift embellishments and fun photo booth props too! Everything you need for an unforgettable birthday! 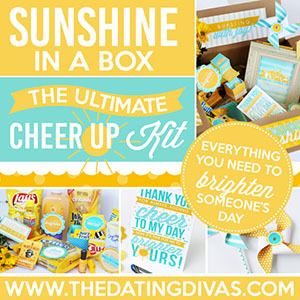 If you are looking for something nice to do, a way to pass a little bit of time doing something kind and productive, this Cheer Up pack is exactly what you need. It’s bright, fun, and happy and is sure to help you put a smile on someone’s face. You’ll get a card to put all your well wishes in, tags to fancy up any special goodies or treats you want to include, decor to make your box extra cheery and more! The best part is this is designed to go in a box, so it’s perfect for mailing if your recipient lives far away. My middle little guy asks me every so often, “Mom, when can you and me spend some time together? Just us.” It pulls at my heart strings every single time and that dreaded mommy guilt starts gnawing away. I try to make time for all my boys, but it can be hard when you’re outnumbered. That’s why I love this last pack. 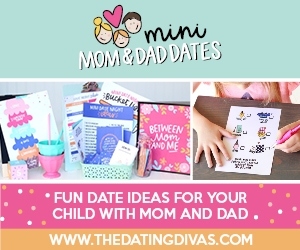 If you want to spend quality time with your kids, this Mini Mom & Dad Dates pack will help you do just that. Make it a big deal and give your child an invitation to the date. Not sure what to do? There are mini questionnaires that will help you figure out what you child is most interested in. There’s tools and resources to help you plan your little dates and there’s even 5 ready-to-go mini dates to help you get started. Summer is the perfect chance to take a little extra one-on-one time with your kids and this printable pack will make it a snap! There’s 9 ideas to help you keep the chaos under control and the memories sweet and happy all summer long. My boys laughing and giggling together is one of my favorite sounds in the whole wide world. I’m so excited for school to finally end so we can focus on playing together. It’s crazy how fast they grow up and I want to squeeze all the memories and fun in that I can while they are still little and want to spend time with me. I know their bickering makes the days long, but they are numbered. I’m doing my best to make them count. And, yes, that even includes having memories prepped and ready to be made. 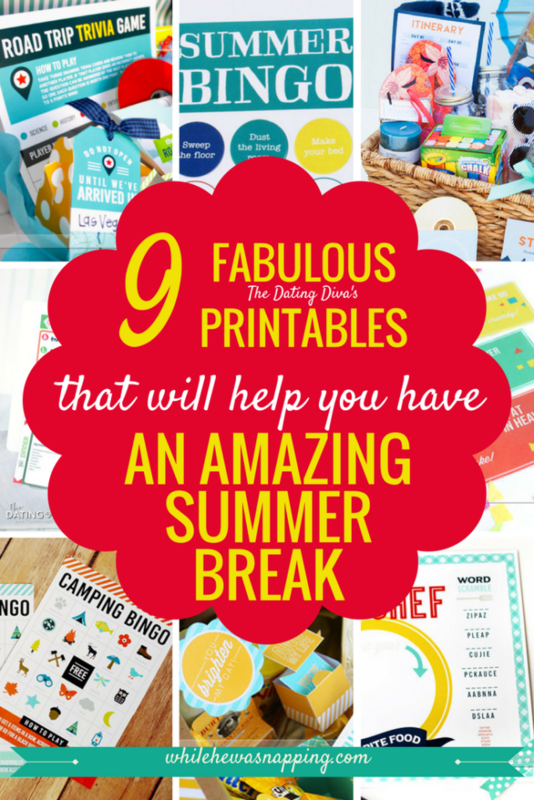 I’m so glad these summer printables will be part of our summer break! 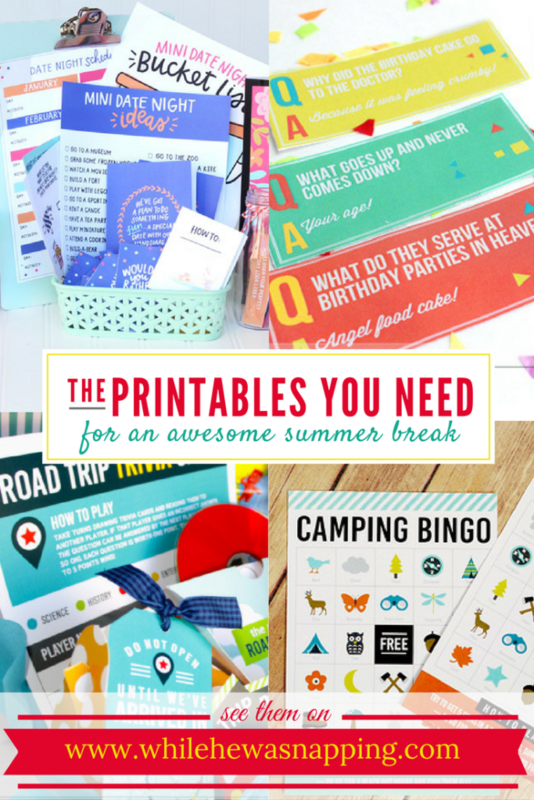 Which summer printables do you want to try first?